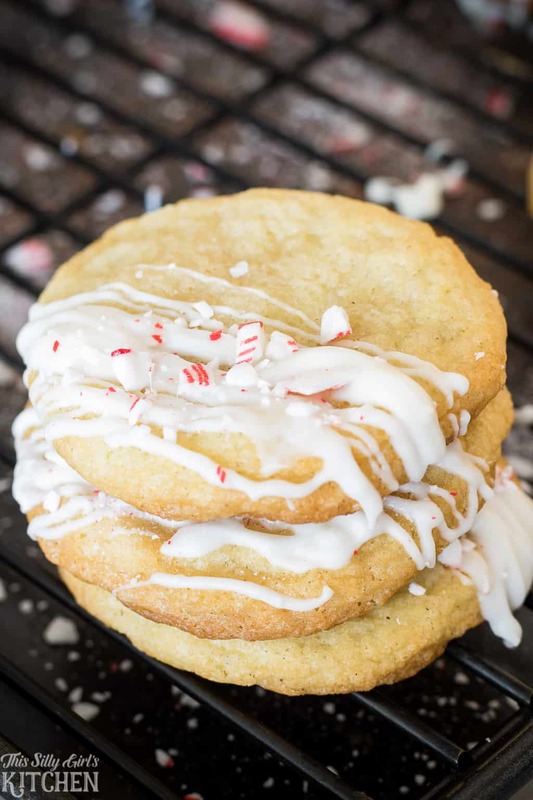 White Chocolate Peppermint Sugar Cookies, classic chewy soft sugar cookies drizzled with white chocolate and crushed peppermint! 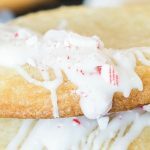 This sugar cookie recipe is my number one cookie recipe I make. Jeremy is obsessed with sugar cookies and I like to make him happy, so I make these the most! I wanted to jazz them up a bit for the holidays and who doesn’t love peppermint Christmas cookies?! The only thing that could make these better is white chocolate, so, of course, I went there! 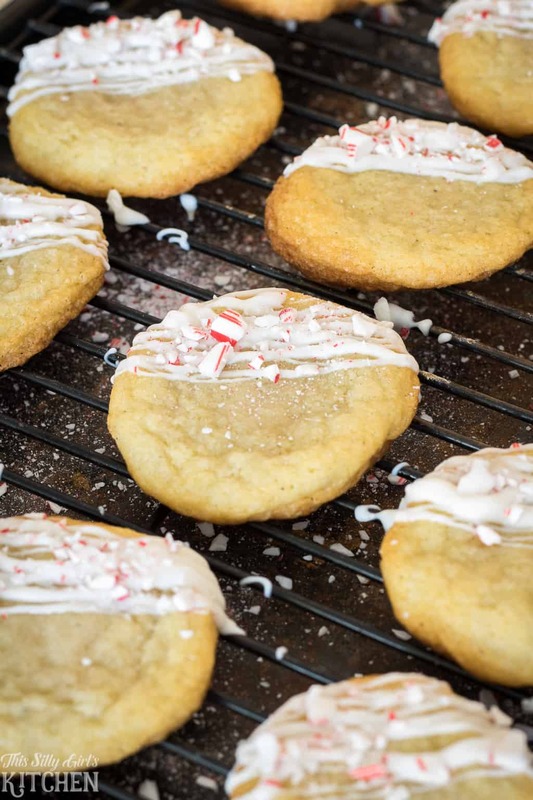 The sugar cookie base is soft and chewy, just like we like ’em. 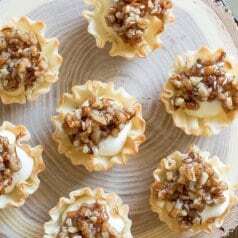 You will definitely make these again and again! The trick I have found out for the perfect soft and chewy sugar cookie is to make sure not to overbake them. You might think they aren’t done baking because the middle will not look set but trust me, they will come out perfect! You will know they are done when the edges are just slightly golden brown. Mix together dry ingredients and set aside. Cream together butter and sugar, add egg, and vanilla. Mix until combined, slowly add the dry ingredients alternating with milk. Bake for 9-11 minutes at 375 degrees until edges are slightly golden brown. Let cool completely. 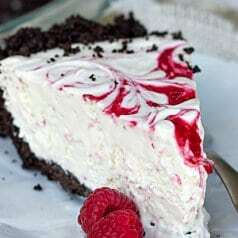 Drizzle with melted white chocolate, top with crushed peppermints. I have to admit, I have struggled a lot with melting white chocolate in the past. It would always come out clumpy and not melt all the way no matter what I would do. I have come to find out that you have to add a little fat to white chocolate to make it smooth. Either a little coconut oil or vegetable oil will do, just add a little at a time until the white chocolate melts smooth. Alternatively, you can now purchase white chocolate melting wafers in the baking aisle or use vanilla almond bark. Both of these items melt perfectly every time. Mix it up, instead of white chocolate, use a dark chocolate drizzle or even chopped up peppermint bark or Andes mints! 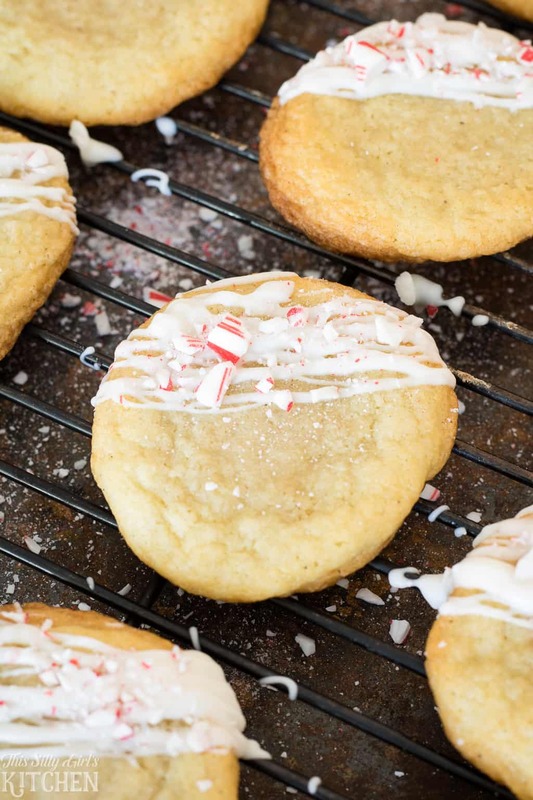 Dye the sugar cookies red or green for an even more festive twist. 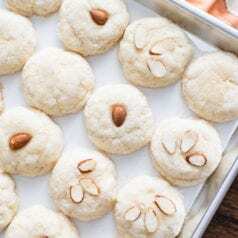 Add extracts to the dough like almond or peppermint! Hand mixer, to mix the dough or a stand mixer works great as well. Cookie scoop, to form even dough balls. Baking sheet, to bake the cookies on. Vanilla Bean Pasta, I love using this in all my baking recipes, the best! In a medium-sized bowl, whisk together the flour, baking soda, baking powder, and salt. In the bowl of a stand mixer or a large bowl with a hand mixer, cream together the butter and sugar until combined. Add the egg and vanilla, mix to combine. Slowly add the dry ingredients alternating with the milk until combined. The dough will be moist but not wet. Cover, place bowl in the fridge for at least one hour. For thicker and chewier cookies, rest overnight. I recommend letting it rest overnight. Preheat oven to 375 degrees. Using a 1 tablespoon cookie scoop, roll out dough balls, place on parchment lined baking sheet about 3 inches apart. Bake for 8-11 minutes until the edges of the cookies are slightly golden brown. Place sheet on a wired rack for 10 minutes to cool slightly, place cookies directly on a wired rack to cool completely. 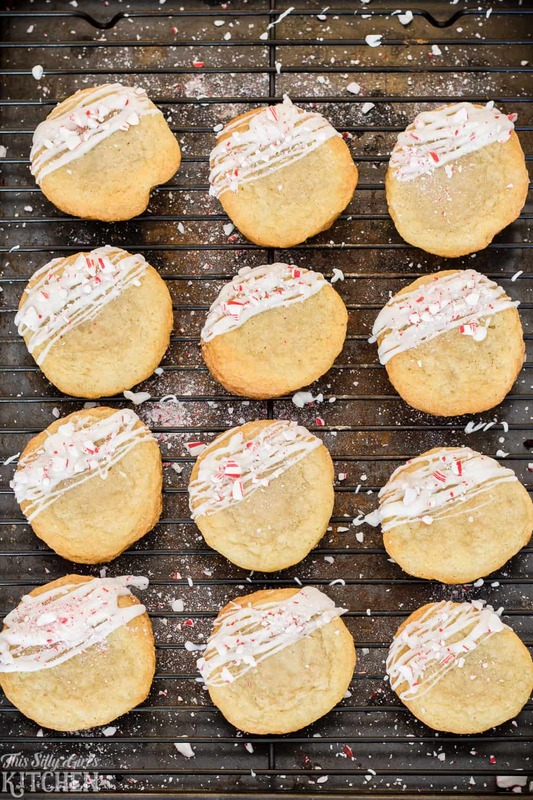 Drizzle the cookies with the melted chocolate, sprinkle with the crushed peppermint immediately so the candy will stick. 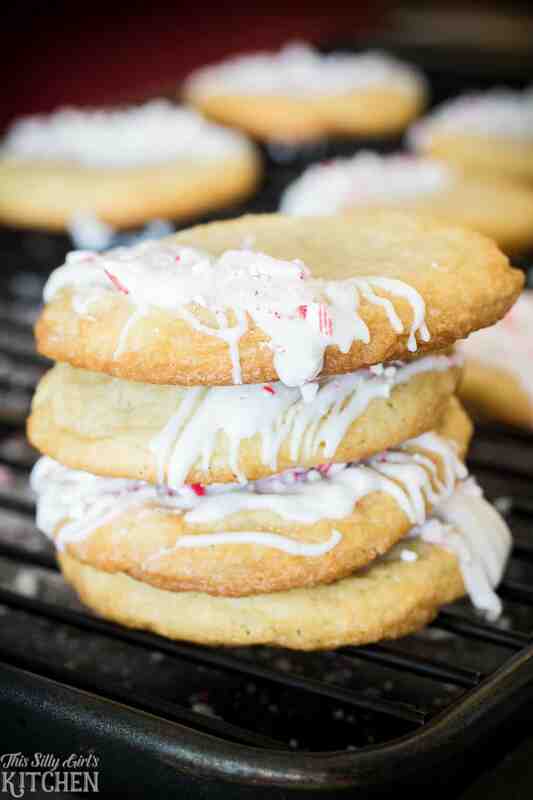 White chocolate and peppermint are two of my favorite flavors, I can’t wait to try these cookies! 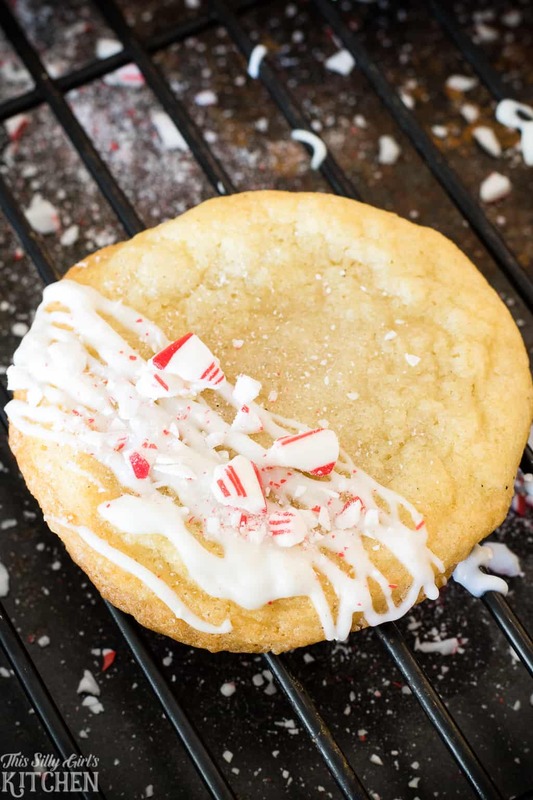 Love this peppermint addition to sugar cookies!